The Amy jacket by 'The Rose...' is a superb modern take on a 1950s style, finished in a beautifully soft, lightweight and versatile Superfine Harris Tweed. 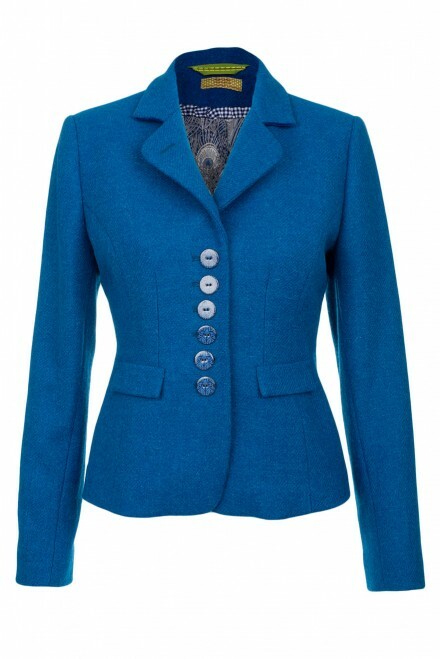 This stunning short fitted jacket is comfortable yet elegant, with a flattering and feminine cut. The Liberty of London lining, and hand painted buttons in William Morris designs really make the Amy jacket stand out against the competition. Every stitch of these exquisite jackets speaks of the quality and attention that has been lavished on each jacket. These Amy jackets have a very flattering and feminine cut, and are designed to be close-fitting. If you are in doubt as to which size to choose, we suggest taking a size larger than you normally would.